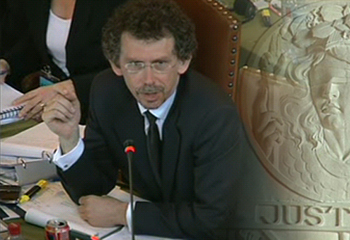 Gary Born, partner and chair of the firm's international arbitration group, presents at the hearing. The Sudan People's Liberation Movement/Army (SPLM/A), represented by Wilmer Cutler Pickering Hale and Dorr's International Arbitration Group led by Partner Gary Born, together with the Public International Law & Policy Group, has received a very favorable award in its arbitration against the Government of Sudan (GoS) in a dispute over the definition and delimitation of the Abyei Area. As a means of resolving a dispute with its roots in decades of civil conflict, the Abyei Arbitration is unique. In 2005, the GoS and the SPLM/A signed the Comprehensive Peace Agreement (CPA), ending four decades of civil war between the North and the South of Sudan, a war that has been described as the “world's most destructive civil conflict.” At the heart of the CPA was the definition of the Abyei Area. The Abyei Area was subsequently defined by a Boundary Commission of Experts (ABC), set up with the full cooperation of the parties, in July 2005. While the SPLM/A was ready to implement the ABC's decision, the GoS rejected it as an excess of mandate. The parties' dispute over the ABC's definition finally resulted in the Abyei Arbitration. The Tribunal in the Abyei Arbitration has now determined, in a near unanimous decision (Judge Al-Khasawneh dissenting) that the predominantly tribal interpretation by the ABC of its mandate to delimit the area of the nine Ngok Dinka Chiefdoms transferred to Kordofan in 1905 (as argued for by the SPLM/A and contrary to the territorial interpretation argued for by the GoS) was reasonable and was not an excess of mandate. In doing so, the Tribunal adopted the meaning of “excess of mandate” argued for by the SPLM/A. Accordingly, the Tribunal upheld the ABC's finding that the Ngok Dinka people of the Abyei Area (and thus the SPLM/A) had a legitimate dominant claim to a northern boundary at 10º10'N, rejecting the GoS claim that the northern boundary of the Ngok Dinka lay along the Bahr el Arab River, significantly further south. Further, the Tribunal adopted the narrow interpretation of the meaning of an “excess of mandate” argued for by the SPLM/A and rejected the GoS's much broader interpretation which sought to include numerous other grounds, including procedural violations, for finding the decision of the ABC a nullity. In this regard, the Tribunal adopted almost verbatim the SPLM/A's reasoning as to why procedural violations, if any, did not constitute an excess of mandate as defined by the parties' arbitration agreement. The Tribunal also adopted the general principle of law argued for by the SPLM/A that even if there were some excess of mandate in relation to some part or parts of the ABC's decision, then the principle of partial annulment should apply such that only those parts found to be an excess of mandate should be annulled. Accordingly, the Tribunal found that the decision of the ABC in respect of the eastern and western boundaries was (in part) not sufficiently motivated and was, therefore, in relation to those parts only, an excess of mandate. The Tribunal accordingly adjusted the eastern and western boundaries. Despite the Tribunal determining anew some of the boundaries of the Abyei Area, their decision categorically affirms the right of the Ngok Dinka people to their historic homeland in the Abyei Area and represents a significant victory for the SPLM/A and the people of Southern Sudan (including the Ngok Dinka of the Abyei Area), who vote next year in a referendum to decide their future. The full text of the award can be found on the PCA website, or by clicking here. Wilmer Cutler Pickering Hale and Dorr LLP has handled a number of important and groundbreaking public international law matters in recent years. Our representation of the SPLM/A in the historic Abyei Arbitration reflects the firm's reputation as one of the world's premier practices for challenging, complex and sensitive public international law matters. For further information on the firm's Public International Law practice, please click here or contact Gary Born.